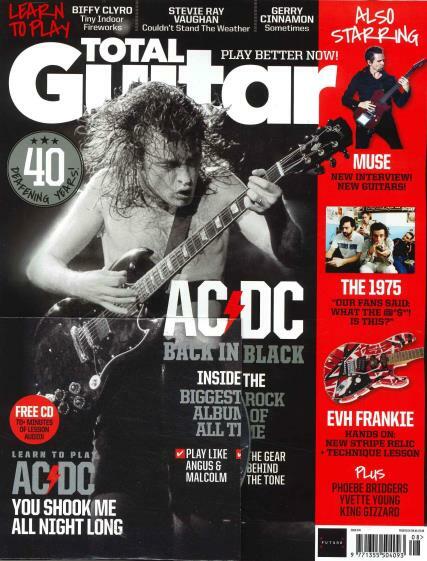 Total Guitar is the best selling Guitar magazine in Europe. It is based in the UK and is a monthly magazine. Total Guitar magazine contains articles on different types of music namely rock, acoustic, punk, Blues, Classic rock and Metal, besides giving detailed profiles of guitarists and the specific techniques and playing styles associated with the guitarist. It is actually aimed at young and novice guitar players, who would like to learn how to play the guitar. The magazine provides dedicated beginner tutorials in acoustic and electric guitar, besides helping those who can already play the basics to develop their playing style and learn new techniques and pick up new songs and solos. The magazine provides great help to all guitar enthusiasts in learning about the instruments, the different playing styles and to keep in touch with the newest techniques which are in use. Total Guitar does an excellent job in inspiring young and upcoming guitarists by publishing interviews and excerpts from conversations with Guitaring Gods. The magazine and its reporters secure many exclusive interviews with guitarists from different genres. I have been a reader for years, Great interview and kit reviews.